The second and concluding volume of a new biography of Henry James and a tour of the trans-Atlantic world in the age of Victoria from James's first great success with Portrait of a Lady to his deathbed struggle to preserve his civilization in a time of war. The New York Times compared Sheldon M. Novick’s Henry James: The Young Master to “a movie of James’s life, as it unfolds, moment to moment, lending the book a powerful immediacy.” Now, in Henry James: The Mature Master, Novick completes his revelatory two-volume account of one of the world’s most gifted and least understood authors, and of a vanished world of aristocrats and commoners. Using hundreds of letters only recently made available and taking a fresh look at primary materials, Novick reveals a man utterly unlike the passive, repressed, and privileged observer painted by other biographers. Henry James is seen anew, as a passionate and engaged man of his times, driven to achieve greatness and fame, drawn to the company of other men, able to write with sensitivity about women as he shared their experiences of love and family responsibility. James, age thirty-eight as the volume begins, basking in the success of his first major novel, The Portrait of a Lady, is a literary lion in danger of being submerged by celebrity. As his finances ebb and flow he turns to the more lucrative world of the stage–with far more success than he has generally been credited with. Ironically, while struggling to excel in the theatre, James writes such prose masterpieces as The Wings of the Dove and The Golden Bowl. Through an astonishingly prolific life, James still finds time for profound friendships and intense rivalries. 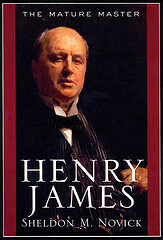 Henry James: The Mature Master features vivid new portraits of James’s famous peers, including Edith Wharton, Oscar Wilde, and Robert Louis Stevenson; his close and loving siblings Alice and William; and the many compelling young men, among them Hugh Walpole and Howard Sturgis, with whom James exchanges professions of love and among whom he thrives. We see a master converting the materials of an active life into great art. "Novick . . . challenges the received image of James as an effete, fussy figure. Far from a fussy celibate, Novick's James was an authentic cosmopolite who led a life as emotionally, sexually and financially complex as those of the characters in his fiction. . . . Novick superbly parses James's sometimes contradictory political views . . . And when Novick discusses the late novels - the genius of James sometimes inhabits and energizes his prose. . . . eloquent . . . left me eager to reread James's novels." "Novick’s goal is to show James as an “active, passionate, engaged” man of his time, rather than as the repressed, passive man of literary myth, and he achieves this goal resoundingly . . . [a] definitive work." "True to the mode of Henry James, Novick is always dicreet yet irrefutable in his scholarship and literary skill. Perhaps in another generation or two, Novick may be supplemented by others, but he will not be surpassed nor replaced." "In the final volume of his masterly biography, Sheldon Novick has created a fresh, shrewd, and indelible portrait of Henry James as literary lion. Ridiculed by some, cherished by many, James emerges vividly: complex, contradictory, yearning for fame, fortune, and, not least, for love. Novick writes with an elegance worthy of his subject in this compelling, fascinating life of one of the world’s most esteemed authors." "Sheldon Novick's vivid accounting stands out, giving us a 'mature' Henry James we can truly know: a passionate man, fully engaged not just with his work, but with friendships and with life itself. . . . [a] rare, intimate portrait of a gentleman."